While the Mayor of London Sadiq Khan has agreed that Southwark Council can determine the Elephant shopping centre application, Delancey failed to getplanning approval for the related Castle Square temporary facility for traders. This scheme must be approved before the main shopping centre scheme can go ahead. Plannning sub-committee B decided to defer the decision because it was, amongst other things, dissatisfied with the rent levels proposed for Castle Sq. The decision to defer the application empowered Southwark’s Chief Planning Officer to refuse the main application- and we argue he should do so, without delay. Unfortunately he has sent a letter to Delancey reassuring them that he won’t be doing that. He’s trying to bounce Planning Sub Committee B into approving the Castle Square application. See further details here. Sign this petition calling on the Lead Member for Planning Johnson Situ to refuse the Elephant application now. Protest again- No to the Castle Square scheme- It’s still rubbish! We demand that the Planning Committee listens to the community and refuses this application. Next week is a big week for the shopping centre. Mayor Sadiq Khan is expected to deliver his decision on the shopping centre planning application tomorrow, after Southwark Council referred their decision to approve Delancey’s plans to him at the end of November. He can either approve, direct refusal or take over the decision himself. Sian Berry AM has written to the Mayor, asking him to call the decision in – read more here. The planning application for Castle Square is also going to planning committee on Tuesday . This the tempororay relocation facility for the traders and is welcomed – but it is too small and there are many outstanding issues, such as length of leases and rent, which have not been resolved with the traders. Delancey must get approval of the Castle Square application before it can proceed with the redevelopment of the shopping centre, so please join us to support the Traders on Tuesday – 6pm, Southwark Council HQ, 160 Tooley St SE12QH – read more here. PS We raised £1800 at the Up the Elephant Party last week – 180 people attended – thanks to Distriandina, DJ Gloria, DJ Fulvio, Arch 7 traders, Elephant Traders Association, Latin Elephant, Southwark DCH, Southwark Notes and everyone who helped organise a great evening. Copyright © 2018 Elephant Amenity Network, All rights reserved. The Mayor has said that he will demand a ‘robust relocation strategy’ for traders displaced by the centre’s proposed demolition and redevelopment. He has also said that he will be subjecting the affordable housing offer to ‘rigorous scrutiny’ and be addressing unresolved transport issues. The relocation strategy is listed as Appendix 10 to the s106 (although titled Appendix 9) and was only published on Friday, 7 December. It outlines how traders will be assisted, but they take issue with the document’s claim that they have been consulted on its contents (9. Trader Consultation). The Trader Panel has not yet been established and the temporary relocation facility at Castle Sq has drawn many objections, for its small size, design, opening hours, leases and rents. As the Latin Elephant objection points out these issues could have been resolved though the Trader Panel, had it been set up more promptly. 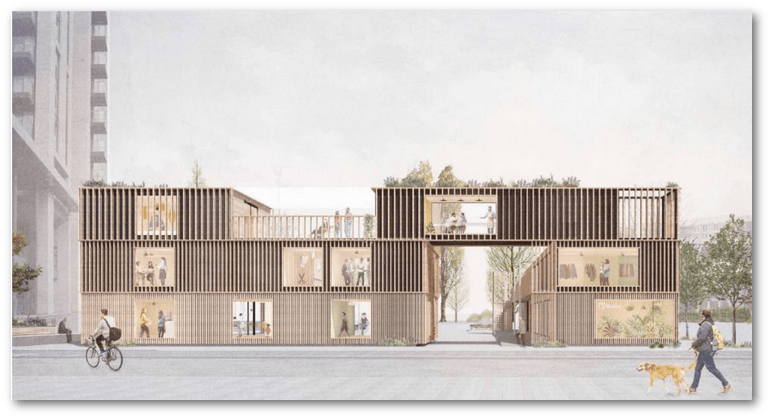 According to the terms of the S106 agreement, Delancey must obtain planning permission for a temporary boxpark before it can proceed with the redevelopment of the shopping centre and this will be decided by Southwark’s planning sub-committee B on 12 December. Aside from the relocation strategy other notable aspects of the draft S106 include no mention of increasing the social housing offer, above the 116 units Delancey has already committed to build, if it receives a GLA grant. Delancey claimed to the planning committee that it had an ‘in-principle agreement’ for the funding, but this claim has been challenged by campaign groups. There also remain several points on which Southwark and Delancey are not in agreement, including the target profit on the residential element of the scheme – Delancey wants 17.5% GDV, Southwark says 12.5% GDV is a more appropriate profit level (pg 39, footnote). This could be significant for getting more affordable housing; if the target is exceeded, half the extra profit should go to Southwark, so it benefits from the lower figure. Page 60 of the S106 agreement (‘Eligibility Review’) also details the complex arrangements for extending the London Living Rent and other so-called affordable, discounted market rent tenancies, beyond their 3-year terms. Tenants who are fortunate enough to see their salary increase during their tenancies may also find much of it going to Delancey, if they jump into a higher band of rent payment – or maybe not, depending on what other affordable units are available at the time. While Delancey is bound to maintain the affordable housing ratios, final decisions on how to do this are left in Delancey’s hands. The shopping centre traders are the people to judge whether or not Delancey’s proposals for trader relocation are ‘robust’, as the Mayor has demanded; but the Trader Panel has not been set up and has had no opportunity to discuss the relocation strategy, yet alone amend or improve it, so this test has not been passed. There are also unanswered questions over any GLA funding for social rented housing; will Delancey get the funding and if it does, will it increase the amount of social rented housing or just use it to subsidise the 116 units it has already committed to build? The Mayor also needs to take a close look at the head-scratching arrangements for extending so-called affordable rent tenancies, beyond their 3-year terms. They are a recipe for confusion and mismanagement and will leave tenants vulnerable and insecure. The case for Sadiq Khan ‘calling-in’ this application is strong, for the sake of shopping Centre traders, the local community and all future residents and the call-in is supported by Sian Berry AM amongst others. Delancey’s scheme does not deserve to be approved and should be rejected. You can still object to Delancey’s inadequate boxpark application here. Small progress but still not enough on traders’ temporary premises -Since our last blog on the Elephant & Castle shopping centre saga, over 100 objections have been made to the temporary boxpark proposals for traders on Castle Square. In response, Delancey has submitted a two-page document covering rent levels, tenancy agreements, service charges, selection criteria, hours of operation, access and the relocation fund. There is now a reconsultation on the planning application proposals. One clear improvement has been made – the facility will now have lift access – but otherwise Delancey does little more than restate its previous position. There will still be no affordable retail units, but Delancey claims that the proposed rents are “discounted in excess of the requirements of the Elephant & Castle SPD”. Delancey also states that traders will be given first right of refusal to the temporary units at Castle Square and units will not be let to others until Delancey receives refusals in writing. However, the overall size of the boxpark facility is still only 492 square metres and there is no increase to the relocation fund of £634k. There is also still no agreement with the traders on any of these and the other issues such as the trading hours, service charges and selection criteria. Moreover, the Traders Panel has only just got off the ground, with no traders yet appointed to the Panel. Until this happens none of these issues can be said to be settled and the “robust relocation strategy” that Mayor Sadiq Khan is asking for will not be achieved. Many of our readers have previously submitted objections. We have drafted a revised objection in light of the minor revisions submitted by Delancey. We must ensure that the traders get the best possible deal, whatever happens; they need the temporary facility, but it must be better; if you would like to help achieve this, please submit an objection using our online objection form. 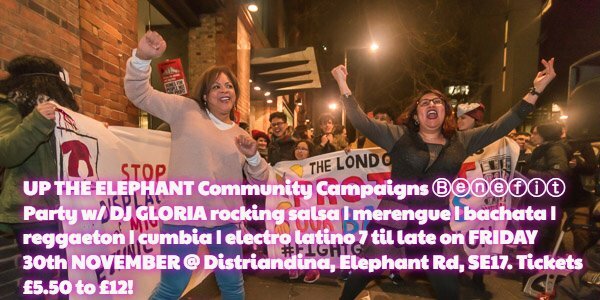 The Up the Elephant Campaign in support of the traders and for more social rented housing at the Elephant is also holding a Campaign Party on this coming Friday 30 Nov – a night of of Latin beats with DJ Gloria (Exilio) to raise funds to pursue a legal challange to Southwark Council’s granting of planning permission for the shopping centre scheme – further details and tickets available here.